Where the Hell is Major Kong? Like most high school "Class of '64" members I was marked by "Dr Strangelove," to the point where I can (sadly) recite scenes almost word for word as well as sing along with “We’ll Meet Again.” It was a film of great characters and great action, none much greater than Major Kong, the cowboy-esque gnarly B-52 pilot, whose descripton of their mission (Wing Attack, Plan R) was one to behold. 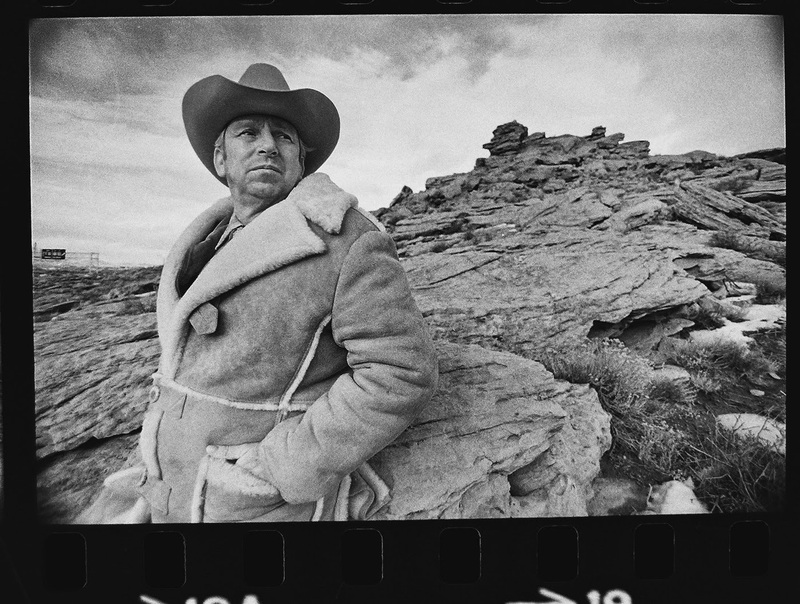 In 1975 I was in Rock Springs doing a story on the new Energy boom in Wyoming, and the morning I was to leave back to SLC I heard a live report on the local radio, that Rotary Club speaker Slim Pickens had just arrived at the R.S. airport. (Slow news day?) I called the station, and asked where he was staying. "The Holiday Inn" was the response I believe. I called the motel, "May I speak with Mister Pickens, please?" There followed the single greatest "HELLLLLLLOoooooooo" I have ever heard on a telephone. After giving him the spiel ("Im with Gamma, a French photo agency, and would love 15 minutes of your time....") he said to come over, and greeted me in a fullscale sheepskin jacket. "Mr Pickens..." I started to say... and he cut me off "Call me Slim..." We went out to the edge of town (about a 4 minute drive,) and he gave me the "Where the Hell is Major Kong????" - Look.... He could not have been any nicer or more sincere, told me great stories about working with Stanley Kubrick. He did say that after Kubrick hired him for Dr S. (and he was grateful) he went from getting 5 Grand a movie as a cowboy extra, to getting 50 Grand as a certified character actor. Slim told me this story: originally the line Terry Sothern wrote while going thru the crew survival kit including gold, rubles, and “one issue of prophylactics” — was "a pretty good weekend in Big-D" ... but shortly after they’d filmed it, Kennedy was killed in Dallas, and they had to change it (you remember the Dallas phobia which ensued...) "I got a call from Stanley, and we went back to the studio.... and ended up improvising "Vegas"... " If you look at his lips during that moment on camera, you can see that they dubbed it. This was just a few months after Blazing Saddles came out, wherein he was able to utter the immortal line ... "Somebody better go back for a shitload of Dimes…" Our session winding up, I left him back at the hotel thinking that I love this job I have. It’s important when you blob and you develop a following, to do it everyday. That certainly is true for 'we're just sayin...". But then you get busy, reprioritize, and the writing goes to the bottom of the list. Enough excuse-making, and back to Blobbing. A week ago we sojourned north on the Ca. coast road. (Sojourn is another one of those words I love and use whenever possible). The coast road from LA through Big Sur and on to Monterey is gorgeous. The cliffs, beaches, rocks and ocean are enchanting. Even the elephant seals, who are really smelly, are incredible to watch -- preferably with nose plugs. Joyce and I started our adventure without any plans about where to stay, or for how long, or what we would do whilst we were in whatever place we happened to be.. Mostly, the trip was without incident. The first place we stayed was on Moonstone beach in Cambria. And the name was an accurate reflection of the beach. We moved on up the coast to the Hearst Castle. That stop is an entire blob... I'll get back to it. Continuing on we had reservations at the Carmel Mission Inn. We made them without having every seen it. It was a little outside the town of Carmel, and was disappointing at best. The kind of place which one would never expect in this upscale community. The exterior was unappealing. It felt like the lower Eastside when they hung the laundry from the windows. The lobby was dirty and the staff unpleasant. Even with our background in politics, and having stayed at some pretty raunchy places, we couldn't stay there. We ventured closer to town and found a perfectly lovely place, Not fancy, but we are not fancy, called the Village lantern Inn. They couldn't have been nicer and we stayed for three days.